Imagine…qualitative research and innovation integrating seamlessly to bring you robust insights about your market, big, bold, consumer-appealing ideas, and action plans for business growth! 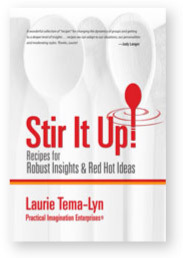 Our new book, written in a fun, easy-to-use "cookbook" format is chock full of multi-sensory activities for market researchers, meeting facilitators, consultants and anyone looking for ways to stir up energy, insights and creative ideas. Available from Paramount Books or on Amazon.